Did you visit your local Post Office recently? Did you receive an invitation card or sale receipt that asking you to participate in The Post Office Customer Experience Survey? If yes, to leave your feedback about your experience, simply go to Postoffice-tellus.co.uk (“Survey Website“)now to follow the instructions to complete the survey. First, open the above survey website and select which type of invitation you’ve received. Click on the corresponding “Enter” button to continue. Second, on the next page, you should enter the required information such as the branch code, visit date and select the language to start the survey. 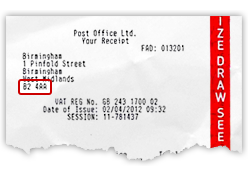 You can find the branch response code from your invitation card or receipt (see image below). Third, the rest thing you need to do is to answer all the survey questions regarding your Post Office experience. It will take you a few minutes to complete it. Fourth, submit your contact information to receive your entry of the Research Survey Prize Draw. You’ll receive a chance to win a £250 High Street Gift Voucher (redeemable at many multiple retail outlets). Enter the Post Office Tell Us Survey now! The prize draw is open to all residents of the UK over the age of 18. There will be one winner each month. Each one will receive a Post Office ‘One4all’ gift card to the value £250. For full T&amp;C’s, please visit Postoffice-tellus.co.uk! I really like your member of staff called Imran work. Very supportive and professional.